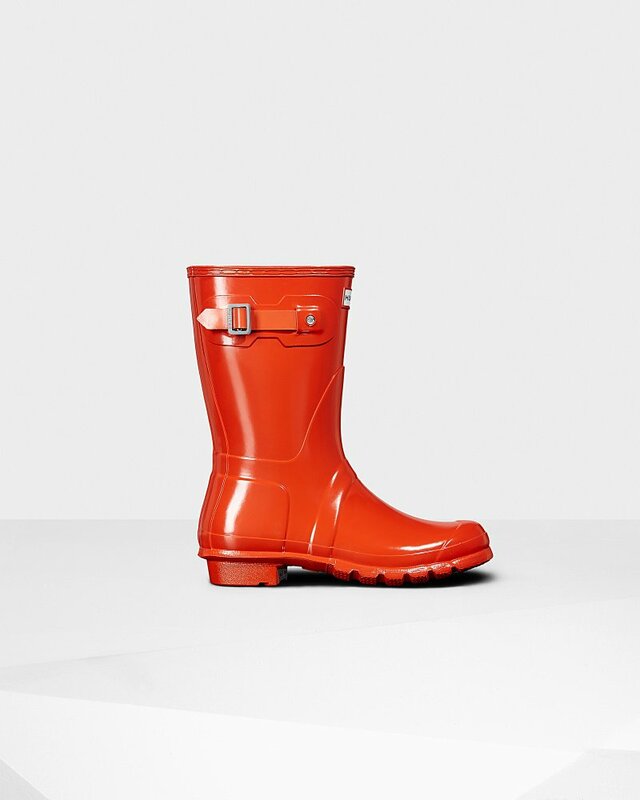 Women's Original Short Gloss Rain Boots is rated 4.6 out of 5 by 760. Rated 5 out of 5 by PLYNNJOHN from Very comfortable! Very cute and comfortable even with my size 11 feet! Rated 4 out of 5 by Rose from Love the Boots, Color Not So Much Love these boots - this is my third pair. The tall boots don't fit my calf but this are perfect. Took one star off because the military red color looks more orange than red, almost a rust color. I am keeping them and will keep watching for an apple red pair. Rated 5 out of 5 by Andrea from Super comfortable, great customer service I was worried about sizing since I am a true US 6.5, but I am happy I went with the size 7. Super comfortable and great quality. Rated 1 out of 5 by donnas from Don't last and Hunter warranty "doesn't cover" Bought these boots (in a slightly different shade of blue that is NLA) in November. By February (and after only a handful of short wears—not enough rain yet), the insole on the right boot had started to peel, making them impossible to wear. My heel gets blisters where the exposed insole rubs against my foot and no amount of heavy sock can dilute the pain. I am hugely disappointed, as I contacted Hunter about this issue and they told me that their warranty doesn't cover this sort of thing. I can understand a warranty not covering normal wear & tear, but the fact that this happened with only 3-4 wears clearly exemplifies that something was wrong. Possibly the insole was not inserted correctly upon manufacturer? I don't know. All Hunter could offer was a discount on a future purchase. I prefer to spend my money with brands that stand by their product and that last. Rated 5 out of 5 by GELes from Worn Nonstop Since They Arrived I have owned these boots for about 2 weeks. I have worn them almost everyday. Perfect for the New England weather - snow and rain. I love the green, neutral enough to go with many outfits, dressed up or down. Best purchase of 2019. Rated 5 out of 5 by JHHinTX from Great! These are great! I wore them in mud yesterday and my feet stayed warm and dry. Rated 5 out of 5 by Jen jen from Happy purchase Color is great, i get plenty of compliments. Had some clarification with correct address and customer service was very helpful to answer and fix issues. I have the tall boot so the short one is a good addition. Rated 5 out of 5 by LimonC from Love the style! Bought these during our “rainy season” in Texas...then the rain stopped...still waiting to break them in! Love the color and style!! !